This is a brief post to inform visitors to Europe about possible car hire pitfalls now that the holiday season is getting into full flow. Our latest car from Kisacar Almeria. Car hire can take your holiday to a new dimension, exploring the many off the beaten track destinations that won't be seen by just sitting around the hotel pool, providing a much fuller view of the country you are visiting. 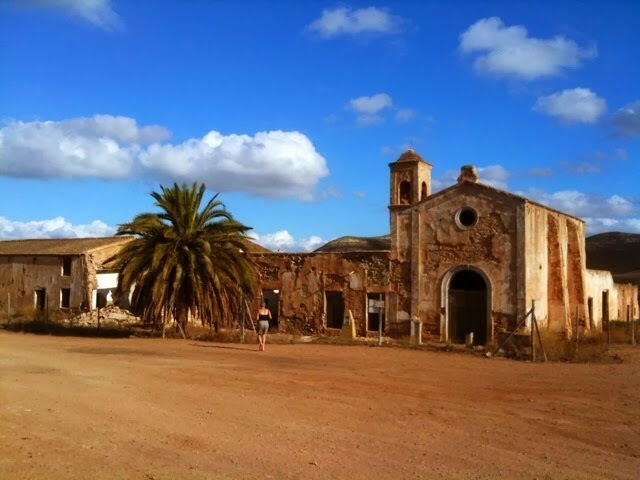 Click on the image captions below for more information about these Almeria locations. We have now hired in Spain over the last 4 years, and each time from a different hire company, as well as speaking to others who have both found excellent deals as well as some that have found, shall we say not so good deals, which only came to light at the end of the hire period in the form of hidden charges. Car hire can be obtained from many sources. Our own first hire was pre-arranged over the internet from one of the major international brands who have desks at the airport. We found this worked well, with a car ready for us to collect on arrival, and the ability to drop off on our way home. The car was clean and new, and the contract came with a choice of whether to return the car full of fuel - or empty, in which case a charge for fuel (at a premium) was made at the outset. The only downside here is that the price of hire is usually relatively expensive, especially when wanting a longer contract. Alternatively we have spoken to others who have hired from a certain popular Spanish based car hire company, and while many of them have found great deals without issues, some have found themselves with excessive hidden charges at the conclusion of their hire period on top of their very reasonably priced headline hire charge. This tells me that perhaps "there is no such thing as a free lunch" and care has to be taken with the choice of company and research should be undertaken prior to the contract, viewing other's experiences if possible. A compromise has to be made between an open and honest hire with a quality product against a very cheap headline cost that may conceal other charges that render the hire to be poor value. 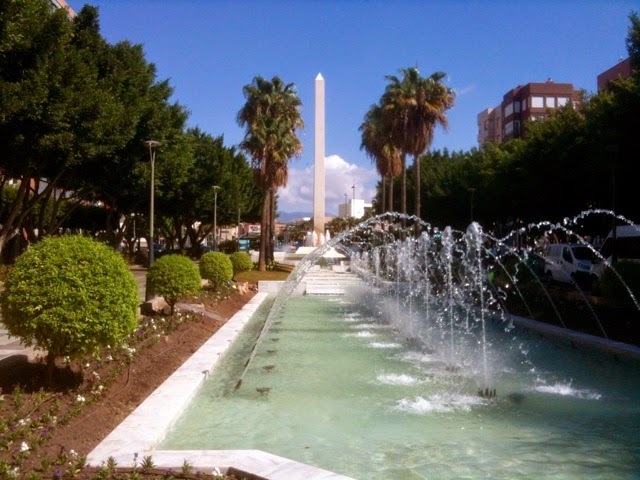 During our last visit to Spain we hired from a local Almeria based company - http://www.kisacar.com/en/ who we found to offer excellent customer service - delivering and collecting our car from our choice of location. Their price was by no means the cheapest, but on the other hand was far cheaper than the major international brands for the month long hire that we did. We concluded that the correct balance had been found, providing an excellent, safe, value for money hire car for a month. 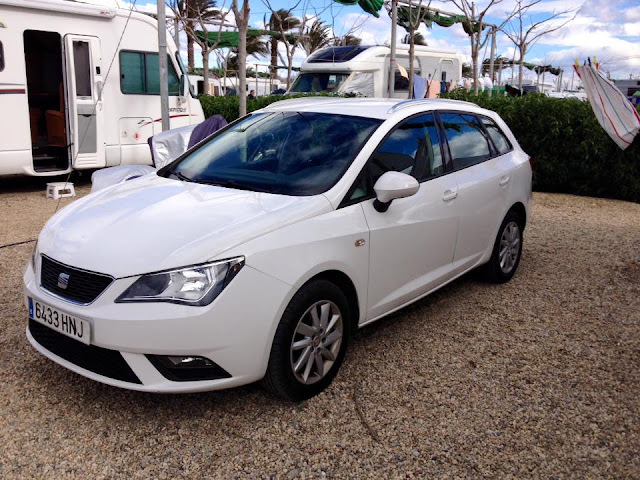 Their car, a white Seat Ibiza in good condition was delivered full of fuel, and we were to return it also full of fuel at our own expense at the end of the hire period. Their representative carried a mobile debit / credit card machine to take payment at our chosen drop off location, and spoke good English. Importantly he also took the time to go over the vehicle's existing minor blemishes for me to agree on the contract form before taking charge of the car - something many companies don't seem to be bothered doing, leaving the hirer open to being charged the high insurance excess payment for damage they were perhaps not responsible for. A close inspection together with the representative at both ends of the hire period is essential. While on the subject of insurance excess, all hire companies will offer a waiver insurance policy intended to cover the excess attached to the main driving insurance policy. This can cost several hundred Euros. We choose to use our own independent annual policy that will provide the same cover for just £39.95 for a year's cover. There are many companies that will provide this, but again after research, we used one called icarhire insurance. When filling in the hire contract forms all that needs to be done is show the evidence of cover. This particular company also have apps available for smart phones, so that this is always available for you to show. All that is required for a successful hire abroad, without being ripped off is a little common sense linked to a little research before signing on the dotted line. We arrived fully home after our 6 month stay on the Continent with the motorhome after a brief stay in the south of England. 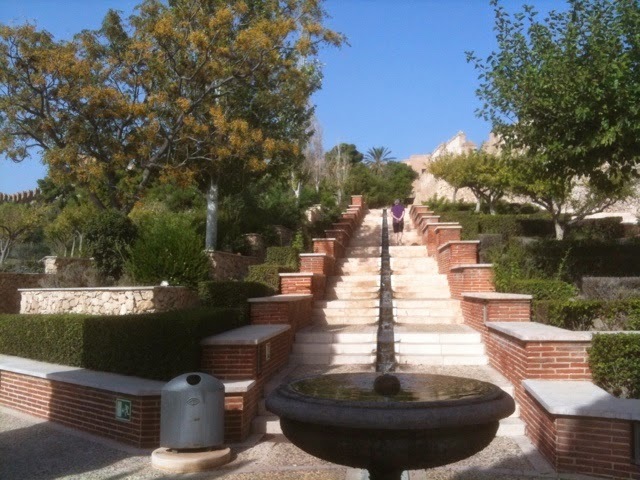 Currently the weather is reversed - lovely warm sunshine here, and unsettled rainy weather in Spain. Six months living in the van took it's toll on consumables, and once we were home it was my intention to give it some attention. The first thing I attended to was to spend a few quid on eBay replacing clips, fasteners, halogen and LED bulbs that had given up while we were away. I also went ahead with a plan that I had intended to complete before we left, but never got around to it, and that was to fit a protector plate to the rear ladder. This is intended to prevent kids boarding the roof of the vehicle at traffic lights so they can take an exciting but dangerous joyride. It didn't happen to us on this trip, but I am informed it has happened to others. At least I have now tried my best to prevent it. Next to attend to was a full major vehicle service and MOT test. This time I chose to use a garage nearby that specialises in the specific requirements of motorhomes, rather than take it back to the supplying (car) dealer who had to spend time having staff drive out to one, as their own workshop facilities are not geared up to these needs - height of lifts and garage entrance doors etc. According to the MOT tester here one of the headlights needed adjustment, which was easily rectified before a full pass certificate was issued. There were no faults found within the service except a worn air conditioning drive belt which was replaced. I had specified 3 new windscreen wiper blades after they had deteriorated in the heat of Spain, which were replaced, and a complete new exhaust system in stainless steel which was not, as unlike the MOT tester two years ago, the technicians here assured me there was absolutely nothing wrong with the existing one. I am not sure whether to be disappointed with that result or not, as I had requested a new stainless exhaust system to prevent any issues occurring while we are away travelling, but I suppose if the old one is OK, it is OK.
Today saw the completion of work that returned the van to first class working order, and ready to tour the UK over the coming Summer months. 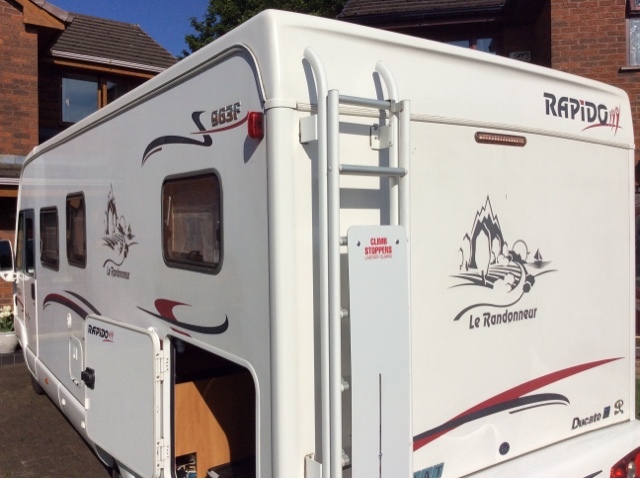 I arranged for an accredited mobile caravan and motorhome service engineer to attend the van on our drive. 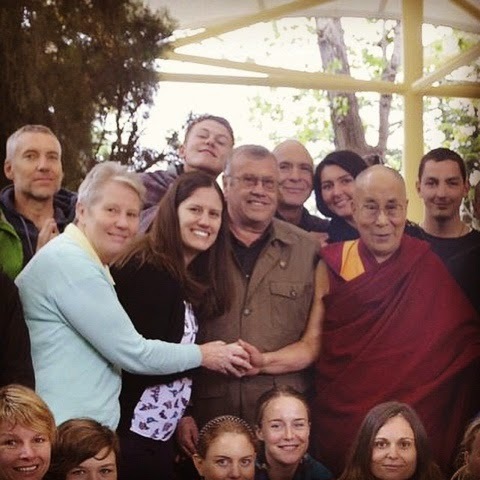 The weather was good, and a full habitation service was completed with all electrical, gas and water systems checked. There were no issues with anything except the 12V charging system while travelling, which I was already aware of. A gas safety certificate was issued at the conclusion of the service. The whole van was also given a clean bill of health on the issue of damp ingress. It is 100% dry on the interior, and well within the accepted readings from the damp meter. As for the charging fault, the symptoms were that the leisure batteries were not being charged while on the move. 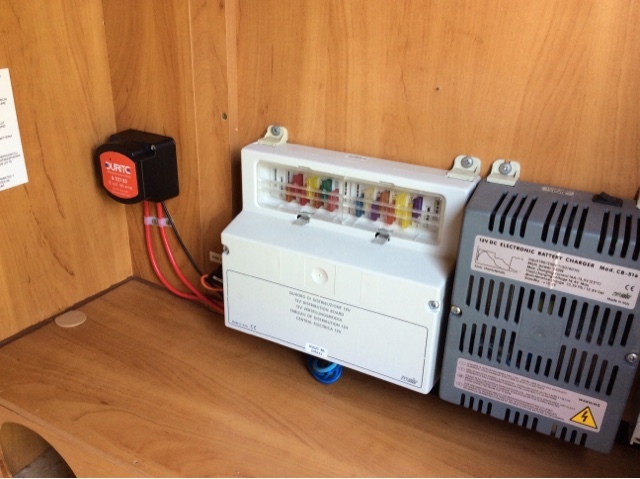 The site mains charger was working fine, as were all other systems which are dependent on the vehicle engine running, such as the fridge freezer. 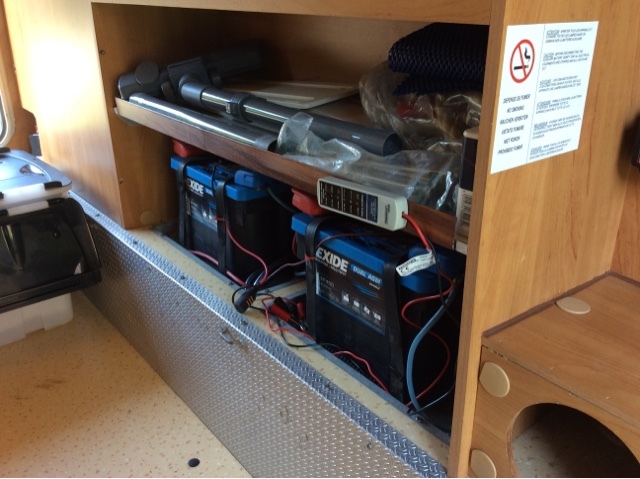 The leisure batteries had failed on our way down to Spain last September, and I believe this is what caused the problem, the charging circuit being constantly overloaded as the batteries could not hold their charge. The batteries were replaced with a pair of quality AGM ones while we were in Spain, leaving only the charging problem to deal with. And there lay the problem. The fridge was being allowed to function with the engine running, but the battery bank it was drawing off was not receiving its replenishment charge. Today, the fault was identified as being the relay that is built into the CBE 12V distribution panel. There were three ways to resolve this - have the panel repaired, or replaced, or as we chose to do, fit a modern electronic voltage sensing relay (VSR) piggy back over the old burnt out ignition voltage triggered relay that is mounted on the panel. A Durite VSR rated at 12V, 140A was connected between the engine battery supply at the panel (already suitably fused at the engine battery in the engine compartment), and the leisure battery supply also at the panel and also already suitably fused. Just 3 connections - B1, B2 and Earth. When the engine is running and the engine battery voltage rises to >13.3V the VSR switch closes, connecting the leisure batteries and the engine battery together in parallel to be charged while on the move. Once the engine is stopped, and the battery returns to its dormant state, and less than <12.7V, the VSR opens, disconnecting the two battery systems and stopping the vehicle battery from discharging while on site. The only downside to doing it this way is that the charge current through to the leisure battery, being outside the panel now, does not display on the head unit. However the VSR is equipped with a red LED to show when it is working, and the user panel still displays the voltages across both the battery systems, showing the increased voltages while on charge. The advantage is of course cost. The Durite VSR was only £35.95 from an eBay supplier, and all is now back to normal in the charging department. Our Rapido is once again fit to tour. 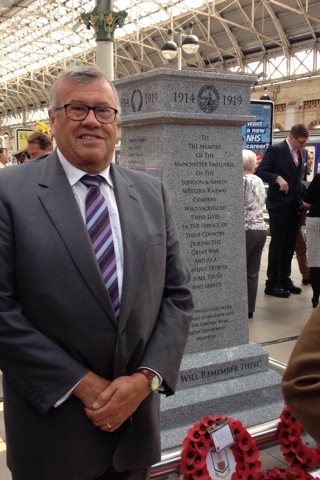 An Interesting Day At The Station. 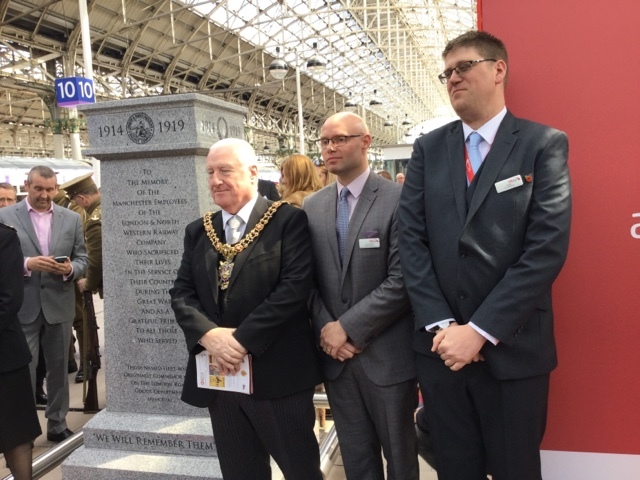 Today, after many years coming, a new memorial stone was unveiled remembering railway men who worked at Manchester's London Road Station (now known as Piccadilly Station), and were either killed in action or died from wounds during the First World War. There had been a bronze plaque built into the wall of the building until the 1960's when, after renovations it was lost. 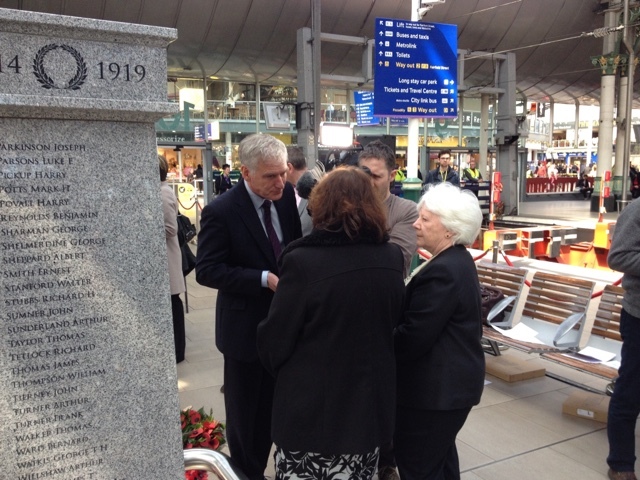 Due to the dedicated research and work over several years by two Virgin Trains managers and a team of volunteers, today's event was eventually able to take place. All that was left of the original memorial was a grainy image, but that revealed enough information about the names listed on it that researchers were able to trace many of their descendants, and I was one of them, resulting in an invitation to attend as a guest today which included media appearances to describe my own feelings. 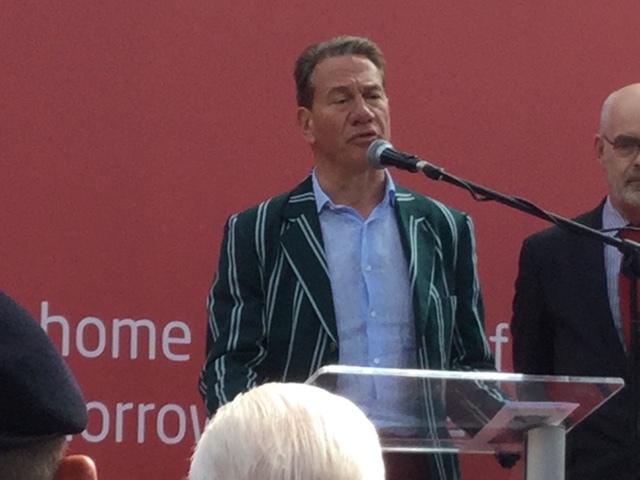 News reports of the event have appeared on both the BBC and ITV news this evening. 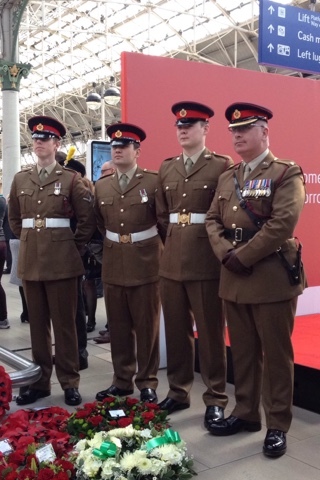 The event was attended by dignitaries including the Mayor of Manchester, the Deputy Lord Lieutenant, senior representatives of the Army, Royal Navy and RAF. 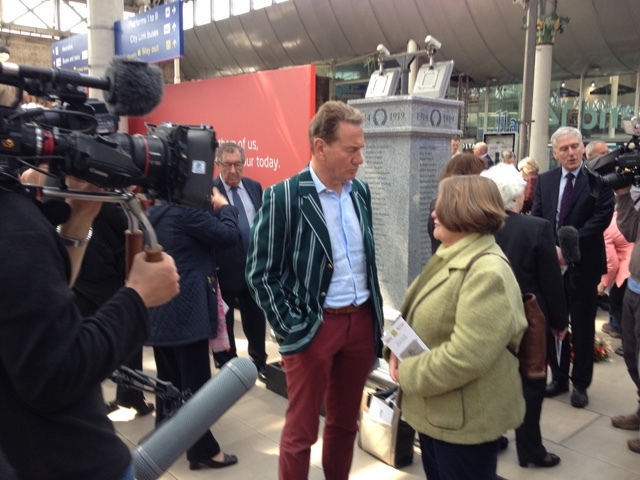 Michael Portillo was also there to unveil the memorial, and footage will appear in a future edition of his TV programme "Great British Railway Journeys" where he follows a 19th century copy of Bradshaw's Railway guide. 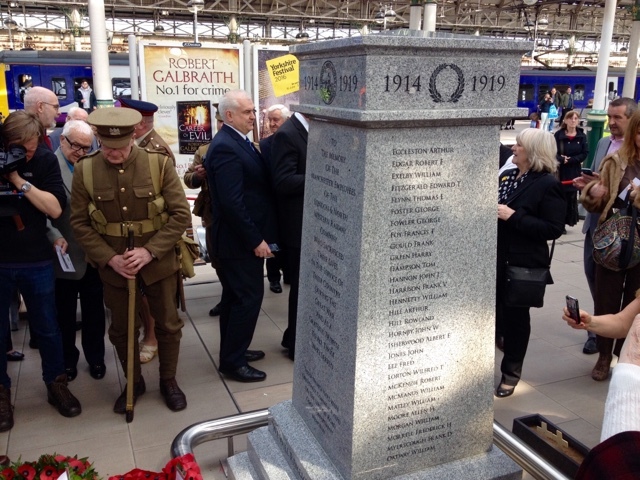 If you find yourself at Piccadilly Station in Manchester, the memorial is located in the middle of platform 10. After the event there was afternoon tea, where we were able to exchange stories with other relatives, (and Mr Portillo), and a very good time was had by all. 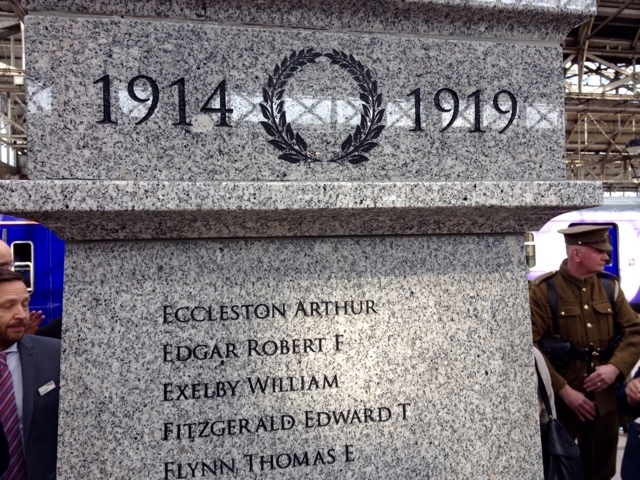 For me, it left me feeling proud that Arthur Eccleston, named on the memorial, was part of my family. He was killed in action in France on 19th April 1918, and is buried in Gommecourt British Cemetery number 2, Hebuterne, in France. RIP.